The NHL playoffs are in full swing. While I love watching playoff hockey, the games have got me up late at night wanting to pull my hair out! If you're a sports fan and loyal to a particular team, I'm sure you know the feeling. 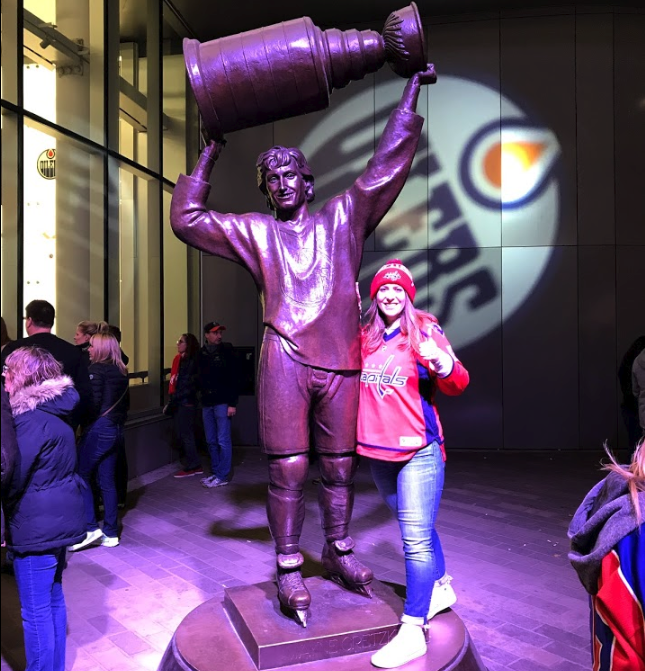 But as the NHL 2017-2018 season winds down, I've been reminiscing about my recent road trip through Canada following my favorite team. Growing up in a hockey family in the suburbs of Washington DC, I had no choice but to be a Washington Capitals fan. I've worn jerseys, gone to games and watched the Caps on TV for my entire life. No Christmas in my family is complete without gifting some Caps gear. So when my brother came up with the idea to follow the team during their multi-game run in Canada, I was definitely in. This was a different travel theme than I'm used to, but I liked the idea of doing something out of the ordinary . There were three games over four days in Vancouver, Edmonton and Calgary, but we extended the trip to seven days (including travel days) in order to fit in some tourism. I worked a full day in Washington, D.C. and left in the early evening to fly to Vancouver. My dad and brother had flown in earlier that day and I met them at our Air BnB in the Fairview neighborhood downtown. We were very happy with our spacious Air Bnb and its central location near the hockey arena. We spent the day wandering the city and walking many miles around Stanley Park. We followed along the seawall to the Lion's Gate Bridge and then strolled around Beaver Lake (its more of a marsh and definitely not a must-see). At this time in October, the leaves were changing and the park was beautiful. That evening, the Caps played the Vancouver Canucks at Rogers Place. They didn't play their best game and suffered a bad loss (6-2.. ouch! ), but it didn't ruin our night. We were happy to watch hockey in a new location with some surprisingly pleasant (and a few very drunk) fans. With no hockey game, we had the full day to see Vancouver. We spent the morning at Granville Island Market and stayed for lunch. We did a little shopping and bought some souvenir chocolates to bring home to my mom. I highly recommend grabbing lunch at the market. There is something for everyone. I got a Montreal-style spinach bagel from Siegel's Bagels. So good and unlike any other bagel I've had! For the afternoon, we booked a seaplane tour with Seair Seaplanes. Both my dad and brother have pilot experience but had never been in a seaplane. On my first visit to Vancouver the previous year, I flew in on a seaplane from Victoria and loved it. 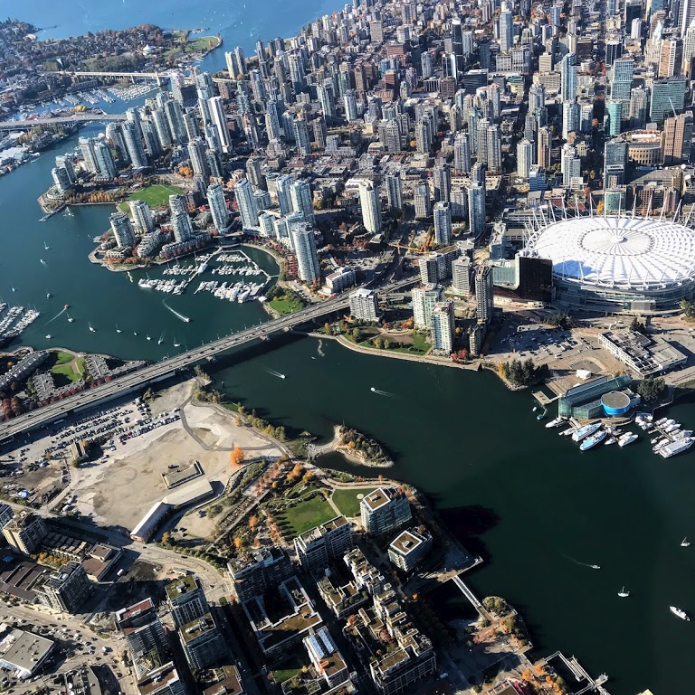 We chose the 30-minute Vancouver City Skyline Tour in a six-seater Dehavilland Beaver. The benefit of flying with Seair instead of HarborAir is they fly small propeller planes (but maybe not a benefit if you have a fear of flying). The tour gave great views of the North Shore Mountains and circled us over Stanley Park, Howe Sound, and downtown. We even flew right over Rogers Arena where we had watched the game the previous night. After the flight, we stopped at Cartem's Doughnuts for a treat. If you go, get the honey parmesan doughnut. It sounds weird, but it's delicious! Trust me. This morning, we flew Air Canada from Vancouver to Edmonton and checked in to The Westin Edmonton. It was a cold, grey day with snow flurries in the air and to be honest, the city wasn't very impressive. Very few people were seen in town and many restaurants were closed. We joked about calling it "Deadmonton" and found out later that the locals sometimes use that nickname too. That evening, we grabbed dinner at Craft Beer Market before the game. Caps played the Oilers at the new Rogers Place. Although Edmonton seemed deserted that day, the arena was packed at night. The people in Alberta sure love their hockey! Luckily, the lines to enter the area were inside so we didn't have to wait in the cold (unlike DC). The Capitals came from behind to win 5-2 and the Edmonton fans were a lot of fun. We even met quite a few Canadian Ovechkin fans that drove in to see him play. If you're a hockey fan, you might know about the 50/50 raffles at the games. Well, this night the total jackpot was over $165,000! That's over ten times more than the average at Caps games. And unfortunately, I didn't win but at least the Caps did! We picked up a rental car in Edmonton and got on the road to Calgary for another game that night. On the road, we stopped for breakfast at Tim Hortons because, you know, Canada. The Caps took a bite out of the Oilers in Edmonton, so I did too. The drive from Edmonton to Calgary was pretty easy and took less than three hours. When we arrived in Calgary, we checked into the Fairfield Inn & Suites Downtown. It was another dreary day, so we relaxed a bit before dinner at Brown's Social House. Caps played the Flames that night at the Scotiabank Saddledome. This area definitely showed its age and had an odd layout, but the game was probably the most fun (aside from the loss). It felt a little bit like a semi-pro game in the best way. The songs were fun, the crowd was happy and the Flames Ice Crew even passed out Halloween candy in the stands. Although it was a good time, the Caps gave up the game in the third period and we lost 2-1. While I love watching hockey, this day was my favorite of the trip! We left Calgary in the morning and drove west to Banff National Park. October in Banff is the off-season for tourists, but the bad part of this was that some roads and access points were closed. We first drove to the beautiful Lake Louise. The lake and mountain view was incredible. If it wasn't so cold, I could've stayed there for hours. If you haven't been, add Lake Louise to your list of places to see someday! We stopped at the Lake Louise Visitors Centers to read more about the area and pick up a map and our free park pass. Then, we hopped on the Icefields Parkway. Every direction you look, you're surrounded by gorgeous snowcapped mountains. I had definitely found my happy place in Banff National Park. We drove along the parkway stopping at almost every lookout point. While we didn't have time for longer hikes (and weren't properly dressed for the freezing temps), we made the most of our visit. And I promised myself that I'd be back for more hiking someday! We drove the parkway all the way to Downtown Banff to stop for pizza at Bear Street Tavern and check out the shops. After exploring the town, we took a short drive to Bow Falls Viewpoint. And wow! Gorgeous! Right on the edge of town is this beautiful waterfall with turquoise water flowing in front of the most perfect mountain backdrop. 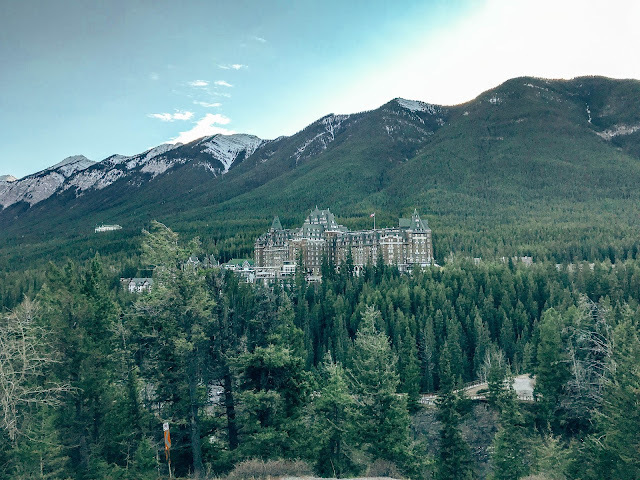 Our final stop in Banff was to check out Surprise Corner and catch the view of the castle-like Fairmont Banff Springs Hotel. You can climb up a long set of stairs to a lookout platform for a better view. A view so good that a couple was getting married when we arrived! Since we had an early flight home the next morning, we went ahead and drove straight to Calgary Airport to drop off the rental car and check into the Marriott Hotel at Calgary Airport. I've never been a fan of airport hotels because I like to maximize my time in the city where I'm visiting, but I think my dad had the right idea when he suggested we stay here. The hotel was located in our terminal so we were able to rest easy and get to our early morning flight within minutes. As much as I would've loved another day in Banff or Calgary, I took an early morning flight back to DC with a short layover in Chicago. 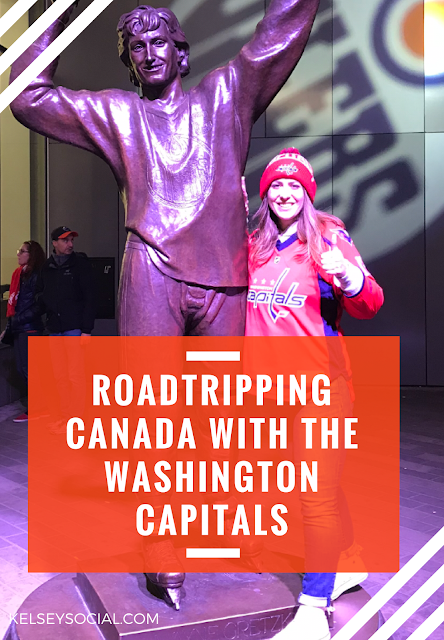 I enjoyed traveling for a specific purpose - supporting the Washington Capitals - and would love to do something similar to this trip in the future. Maybe following the Capitals through California next season? Or attending the FIFA Women's World Cup in France? We'll see! Let me know if you have any ideas for sports-themed travel!